I’m Stacy Fisher, the founder of Living Upp. I’m an author, speaker, and lifestyle coach with more than 19 years of experience in the healthcare industry as a registered dietitian and certified diabetes educator, where I’ve worked in private practice, in medical facilities, and with large companies such as Dell, Boeing, and Nike. 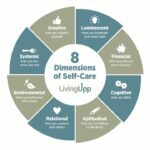 I use a unique 8-dimensional self-care framework to teach individuals and organizations how to create customized lifestyle plans that help them experience better health, more balance, and greater adventure. When I founded Living Upp in 2015, my marriage was in big trouble. I didn’t realize then just how significant self-care would become for me, but it would later prove to be my lifeline. I created the 8 Dimensions of Self-Care to help pick myself up from that heavy moment, so I understand on a personal level what a powerful healing tool it can be. Because here’s the thing: we all experience heavy moments — job losses, separations, divorces, financial difficulties, loss of friendships, death of loved ones, debilitating injuries and illnesses. And those unexpected curveballs that life sometimes throws our way can really take a toll on us, which is why having a plan in place before we face challenges can make all the difference. In this community, I often write about real, raw life experiences in a way that brings lightness and hope. Because the truth is, when life goes off the rails we don’t have to crumble. We can use self-care to pick ourselves up, and we can choose to experience the joy and beauty that exists all around us. That’s what Living Upp is all about. It’s about knowing what you need and giving yourself permission to receive it. It’s about caring for yourself so you can be in service to others instead of a heap of a crying mess on the floor. (I’ve been there and it’s not pretty.) And it’s about designing your life to live in closer alignment with your inner truth. So, instead of feeling paralyzed or choosing unhealthy coping strategies that steal your joy, I hope you’ll become part of this community and learn how to put self-care to work for you. I’m a Registered Dietitian Nutritionist and Certified Diabetes Educator who has worked in just about every health care setting you can think of…hospitals, nursing homes, assisted living facilities, doctor’s offices, private practice, and corporate wellness. I’m an INFJ (if you’re into the Myers Briggs thing), which means I prefer snuggling up in a warm blanket and reading a book over going to an all-night rager. I appreciate colorful language. I’ve been known to drop an occasional f-bomb. To me, there’s something refreshing about people who speak their truth without letting inhibitions get in the way (as long as the intent is to be humorous and not to inflict personal pain). Do you have a warm heart and a sailor’s mouth? Then you’re probably my people. I want my life to count for something. I share George Bernard Shaw’s desire to be thoroughly used up when I die. I’m in a deeply romantic relationship with nature. There’s just no other way to say it. Growing up on my family’s small farm in Ohio, I learned a lot from the natural world: how to use what you have, what it feels like to work to physical exhaustion, how to solve problems creatively, and what the circle of life truly looks like. Perhaps that’s also where I fell in love with nutrition. The garden was a magical place for me…an art studio, my sanctuary. I LOVE chickens! Sadly, a black bear incident left me brokenhearted and chicken-less, but I’ll have more chickens again someday. I believe real, whole food outperforms manufactured products. But even if you don’t agree, I promise to respect your choice to nourish your body in a way that makes sense to you. I also believe that eating is personal, and that there is no single “diet” that’s right for everyone. Each of us brings our own set of beliefs, traditions, experiences, medical needs, and flavor preferences to the table. I love helping people discover their own personal eating style. I’ve learned that imperfection is underrated. I don’t dig the shame-based, judgmental approach that many health professionals take these days. I won’t pretend that I have all it all figured out, but I do know that if we’re doing our best, that’s enough. I’m cool with being imperfect and I hope you are too. I’m committed to creating a positive, empowering community for you to grow and express your inner truth. I sure hope you stick around. Is it time to create a self-care plan that fully supports you? Registered Dietitian Nutritionists (RDNs) are food and nutrition experts who have met the following criteria to earn the RDN credential: 1) Completed a minimum of a Bachelor’s degree at a US regionally accredited university or college and course work accredited or approved by the Accreditation Council for Education in Nutrition and Dietetics (ACEND) of the Academy of Nutrition and Dietetics, 2) Completed an ACEND-accredited supervised practice program at a health-care facility, community agency, or a foodservice corporation or combined with undergraduate or graduate studies. Typically, a practice program will run six to 12 months in length, 3) Passed a national examination administered by the Commission on Dietetic Registration (CDR), and 4) Complete continuing professional educational requirements to maintain registration. Certified Diabetes Educators (CDEs) under the National Certification Board for Diabetes Educators (NCBDE) must be a) A clinical psychologist, registered nurse, occupational therapist, optometrist, pharmacist, physical therapist, physician (M.D. or D.O. ), or podiatrist holding a current, active, unrestricted license from the United States or its territories; OR b) A dietitian or dietitian nutritionist holding active registration with the Commission on Dietetic Registration, physician assistant holding active registration with the National Commission on Certification of Physician Assistants, clinical exercise professional holding active certification with American College of Sports Medicine (ACSM) as a Certified Clinical Exercise Physiologist (ACSM CEP), previously known as ASCM Certified Clinical Exercise Specialist, clinical exercise professional holding active certification with the ACSM as a Registered Clinical Exercise Physiologist® (ACSM RCEP), health educator holding active certification as a Master Certified Health Education Specialist with the National Commission for Health Education Credentialing; OR c) A health professional with a master’s degree or higher in social work from a United States college or university accredited by a nationally recognized regional accrediting body. It also requires a minimum of 2 years of professional practice experience within a health-related field (as noted above) and a minimum of 1000 hours of diabetes self-management education (DSME) experience, along with a certification examination. In 2016, Stacy completed the Wellcoaches Certified Health and Wellness Coach training program. Coaches must hold at least one of the following: 1) A Bachelor’s Degree or higher in a health related field, 2) A license, or license equivalent, in a health related field, 3) A Bachelor’s degree, or higher, in an area of study unrelated to health and wellness and a certification in a health related field, or 4) No degree and a certification in a health related field, with a minimum of 2,000 hours of work experience in the field. After completing either an 18-week online course, or a 4-day live course, students must pass a written exam, a practical skills assessment oral exam, complete a 2-day organization course, and submit practice client records. In addition, she also became an ACE-Certified Health Coach. Requirements include the following: 1) must be at least 18 years of age, 2) must hold a current adult CPR and AED certificate including live skills check, 3) must hold either a current NCCA-accredited certification in fitness, nutrition, health care, wellness, human resources, or a related field; or hold an associate’s degree or higher from an accredited college or university in fitness, exercise science, nutrition, health care, wellness, human resources or a related field, or two years comparable work experience in any of these specified industries, and 4) pass a certification exam. The Commission on Dietetic Registration’s Certificates of Training in Adult Weight Management are intensive programs that provide in-depth training related to the treatment of adult weight management, and include topics such as pathophysiology, dietary modifications, physical activity, pharmacotherapy, appetite regulation, intensive behavioral treatment, bariatric surgery implications and complications, relapse prevention, weight maintenance and counseling strategies. Stacy completed the Level 1 certificate of training in 2003, and Level 2 in 2014. Stacy has obtained the Heartsaver® CPR AED certification through CPR Seattle, an American Heart Association partner.